This is probably one of the easiest recipes we make in terms of prep as there are very few ingredients and I didn’t need to do too much with them. I sliced up the mushrooms as thinly as I could and then turned my attention to the leek. A leek, as you can see in the photo below, looks kind of like a giant scallion. I cut off the bulb end of the leek as well as most of the dark green part. I then rinsed it under running water to get the remaining dirt our and split it in half lengthwise. I saved one half (the full recipe calls for one whole leek for four servings, but we were only making two servins) and sliced the remaining half into ½ inch pieces. Cooking for this recipe is also very easy. 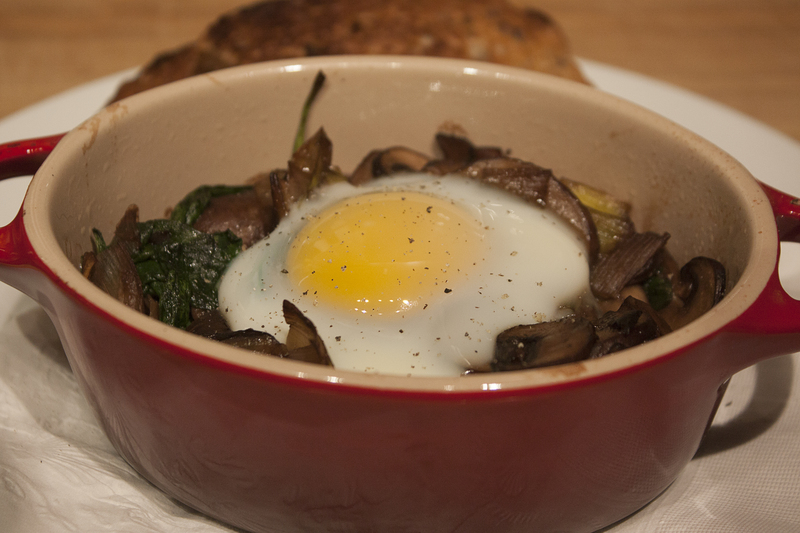 I sautéed the leeks in our Dutch oven for few minutes and then added the mushrooms. I covered the pot and let the mushroom cook down, stirring every few minutes or so. I then added the liquid ingredients (soy sauce and red wine) and cooked everything a little longer, finally adding the spinach and cooking that just until it wilted. I divided the mixture evenly between two oiled cocottes (little dishes with high sides) and cracked an egg on top of each pile of veggies. The cocottes went into the oven for the full twelve minutes and when they came out the eggs were exactly as they were supposed to be: whites just set, yolks still runny. (You can of course cook the eggs longer if you like). In retrospect, I should have probably used two eggs per cocotte, but one egg made for a relatively light dinner, which was nice too. We had the eggs with some wheat toast and a white Bordeaux (Château Haut Rian Bordeaux Blanc) for a fast but elegant weeknight dinner.